Welcome to RMR Equipment Rental! Founded in 1999, RMR Water Trucks & Equipment Rental Inc. of Castaic, CA has continued to provide outstanding service, dependable water trucks, and overall customer satisfaction to all of our clients and customers for the past 10 years. We operate on the fundamentals of providing our customers with great service, competitive regional pricing, on-time water delivery, and quality drinking water. We are always committed to working harder than our competition. No job is to big, nor too small for us to handle. 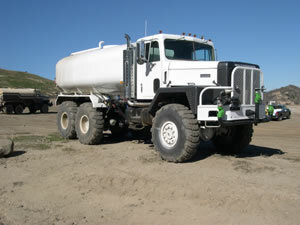 RMR Water Trucks and Equipment Rental Inc. is based in Castaic, CA and focuses on serving the businesses and residents of Los Angeles, Kern, and Ventura Counties in providing them with all of their water truck needs. In addition to serving the above counties, we can provide water truck services to virtually anywhere in Southern California, as well as Las Vegas, Nevada. Give us a call today and our experienced staff will work with you in providing all of your water delivery needs. RMR Equipment Rental is part of the RMR World of Companies.